Go for stand out luxe with this stainless steel and rose gold-plated bracelet watch from Vivienne Westwood. 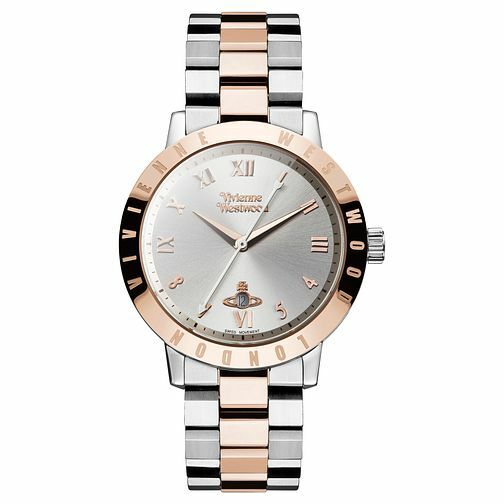 Featuring a chic silver tone dial with classic logo branding and roman numerals, the crowning glory of this stylish timepiece is the rose gold plated bezel adorned with 'Vivienne Westwood London' in rose gold tone. Vivienne Westwood Ladies' Two Colour Bracelet Watch is rated 5.0 out of 5 by 2. Rated 5 out of 5 by Anonymous from Stunning Viv Westwood ladies watch A stunning watch that my wife chose and she loves it. Excellent detailing and the perfect fit. Service was superb and can highly recommend the gift wrap service! Rated 5 out of 5 by Anonymous from Very happy with product This product is amazing quality and I'm very happy with my purchase. It was a really good price and not only that the store were very helpful when I took it in to remove links. Would definitely purchase from earnest jones again.